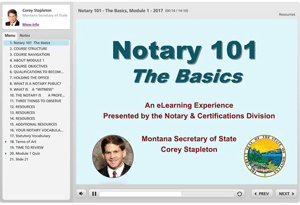 Notary 101 – The Basics is an eLearning program designed and created by the Notary & Certifications Section of the Montana Secretary of State’s Office for new Montana notary applicants. This course covers information that is necessary to know in order to successfully complete proper notarizations and pass the Montana Notary Examination. The course is composed of 4 modules. Modules 1, 2, and 4 will each take about 30 minutes to complete. Module 3 takes about one hour to complete. You can take the course one module at a time, or continue through all modules at one sitting. If you start a module but are unable to finish it in one sitting, as long as you use the same computer you started the module with, you will be able to resume the module at the point you stopped. This course is designed primarily to meet the examination requirement for new notary applicants, but it is also available as an excellent refresher course for currently commissioned notaries. Notice – Before beginning the online training, please make sure that you are using the most current version of your browser. Once you have updated your browser, you will need to delete your history and restart your computer before opening the training modules. We suggest that you use Internet Explorer as your browser if possible. If you experience technical difficulties during the training, please clear your history and restart your computer. You will not be able to resume where you left off after updating your system or restarting. If you have any technical problems with the training modules, please call (406) 444-5379, or email [email protected]. With your help, we’ll exorcise the computer gremlins, and provide you with an easy and enjoyable way to learn all you need to know to become a notary public in Montana. You may link directly to the individual modules from the links below. The Secretary of State is committed to providing reasonable accommodations for people with disabilities. If you need an alternative format by which to view the Secretary of State’s online notary training course, or any other accommodation, please contact our ADA coordinator.